Sometimes I just have days where I am not digging writing a real review. So I thought "What else can I write today?" and decided to just sit down with you and discuss one of my favorite books of 2016: My Lady Jane. Why Should You Read this BRILLIANT story? I am SO glad you asked. Seriously, if you don't believe me go read the chapter sampler on Amazon. This trio of authors is so hilarious. I was in fits of giggles the entire time. In fact, My Lady is compared to The Princess Bride, so OF COURSE it is going to be a comedic gem. The idea behind this book is so weird but it works wonderfully. An alternate retelling of the short reign of Lady Jane Grey with magic? Count me in! Each author wrote one POV. Somehow all three of our main characters were equally wonderful and amazing. 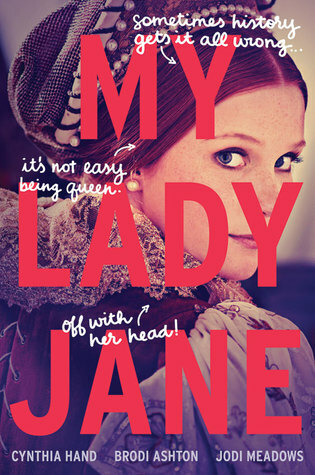 We have, of course, Jane... a bookish girl who never expected to be queen. Gifford, or "G", her husband, who has a slight predicament on his hands. And King Edward, who was hilarious. Also, there were really cute, funny romances for each character! 5) There will be MORE "Jane" books! So you better read the first book now so you can prepare for the others. Just saying. For a more in depth review I recommend reading Emily May's review on Goodreads. Click here.